If I were Bourdain, I would've bit in with gusto. I'm not. I trembled and felt I had to do it. It's now 3:45 and we're off to a 4-yr old birthday party. Wish me luck. It's been 5 minutes and I'm still alive. How was that suspense? No, didn't die, not even a twinge of stomach disruption. And, it tasted darn good. My advisor in all things pork, Andrew, suspects it's a tad under-cured, because the innermost core of the sausage still looks a bit more moist than the outer ring of familiar dried sausage. • I'll let the remainder hang in the humid environment and keep cutting them open for observation every couple months. This will be a learning batch. • I think it was a reasonably good run; no rancidity observed at the temps/humidity. • In the future, I will go one step further regarding safety and freeze per CDC recommendations to insure a higher level of safety. It's an easy step, no reason not to do it (although some French buthers would never freeze meat prior to processing). • The way in which I pierced the casings was not good. I must use a PIN and not a knife point. Some of the sausage was funny shaped and it could have compromised the integrity of the casing during drying. • I'm switching to fresh (not dry cured) sausage (sage and sweet Italian for starters) for additional experience with grinding and mixing techniques. • The humidity fussing I did earlier was silly. From all I've read, more humid is better. Too much humidity only slows things down. I simply hung them on a hanger inside of a tall, clean trash bucket in which the bottom had a few inches of water. This environment, with the sausage curing gives a steady 80%+ relative humidity and my basement was about 65°F during the entire cure. 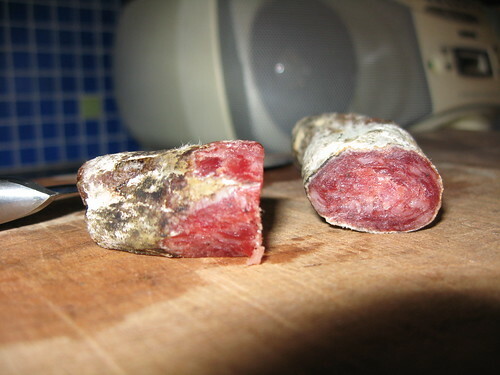 • Finally, I think I need much wider casings for the sausage since it shrinks a lot on curing. • Definitely a project I will revisit! !!! amazing. congratulations. i am SO impressed. was it as tasty as you hoped and dreamed it would be?? could you give us some stats on temperature, humidity, aging time?? I was going to ask if you survived the sample, but I don't suppose you could post if you didn't Report back soon! Hey, I missed the sample at the party, we'll have to catch up again soon! Pretty damn solid for a first run! I wouldn't have let you have any. I had to endure at least 24 hours to make sure I wouldn't have killed anyone. A little like Pasteur, only not on my kid.